The whiskey and beers weren't enough. Those train tracks were active. And not even a real door between me and them. Then some rooster started off -- he wasn't in the room, but he could have been. Then the kids. First just their noise, then they were opening the shutters and poking their heads though the windows! I ignored the 6 a.m. alarm, but finally got up when I couldn't ignore the heads poking in the window. I loaded the bike, and was off, dropping by the restaurant to say good-bye to Miew. 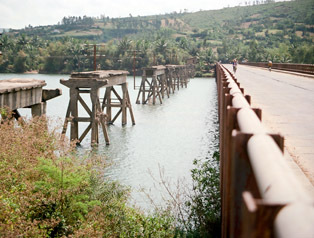 One hundred yards to the north of the village began the climb over the Dai Lanh Pass. Thirty-seven k later I was in Tuy Hoa. This presented a problem, because I knew there was a hotel here, but the next one I was sure of was in Qui Nhon, 118 k farther on. It was 10:15 a.m., and we had a situation similar to that of day one-- should I stay or should I go now? I found the hotel, asked inside if there were any accommodations before Qui Nhon. The desk clerk said she didn't know. 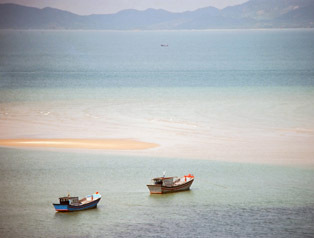 I asked in the attached restaurant, and the host said there was a small hotel, in Song Cau, about 50 clicks farther on. Dilemma. What if there weren't? I ate an early lunch, and decided to push on. I passed beautiful coastal scenery, and after a few hours, started keeping my eyes peeled for a sign saying Song Cau, or a hotel. Then I blew out the sidewall of my rear tire. I actually didn't go flat -- a kid pointed out the tube pushing through the crack when I stopped to buy more water. Across the street was a bike repair shop, and for 2000 dong (about 19 cents) I had the repairman glue a piece of rubber to the inside of my tire. I rode on. It was getting later in the afternoon, and I began to get concerned. Based on my calculations, I should have come across Song Cau by now. I glanced at the backside of one of the periodic roadside mileage markers and froze. Somehow, Song Cau was now 12 k behind me. Winds are bad for bicyclists, but backtracking is even worse. I hadn't seen anything back along the road that could have been a hotel, but thinking about it, there was nothing back in Dai Lanh pointing out that "guest house" either. I pulled into the next roadside restaurant, and acted out my need -- a place to sleep somewhere before Qui Nhon. The proprietor seemed to understand, and indicated that it was still in front of me. That was great news, except for the fact that the guy in Tuy Hoa had said that it was in Song Cau, which I had already passed. I pushed forward. 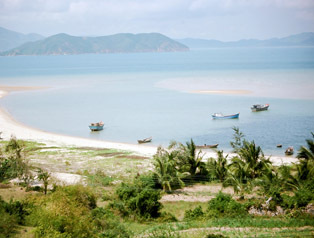 If anything, I'd make it to Qui Nhon, even though my map indicated that I'd need to climb another pass. 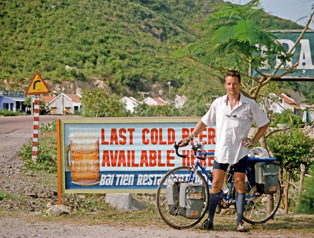 A few kilometers later, I came across a big sign, in English, stating "Last Cold Beer". The sign beckoned and I pulled over. Lo and behold, behind this roadside restaurant was the Bai Tien Hotel - a 10-room hotel on stilts over the water. They've got room, and they've got cold beer! I check in. This is a closeup of the 2 boats in the prior photo. Last cold beer? I hope not, but a great excuse to stop for the evening!